To the east of Manchester; across the Lancashire / Cheshire border. The vast majority of it is perfectly reasonable, even an extremely useful by-pass for several congested town centres. The two ends! Oh my life, the two ends are awful! Surely they can't be all that bad? It's maybe a bit unfair to be that damning. This is probably the only motorway in Britain, though, where neither end is finished! The western terminus is at a roundabout with the M60 (formerly the M66), but is older than the other motorway at this junction. There's what the locals call "The Ski Jump" where the unfinished junction has stubs for a flyover over the junction. But... remember that this motorway is older than the roundabout, so the flyover can't be intended for that. Where on earth was it supposed to go from here? Certainly in towards Manchester - maybe even to follow the A57 in to the city centre and meet the A57(M)? As for the eastern terminus - well. It ends on a roundabout and essentially dumps all its traffic onto the narrow single-lane A57 through Mottram. Inevitably, there's always queuing traffic exiting the roundabout. Locally, there is a big fight over a by-pass with some locals being for the construction, and some being against. There are, however, reminders about a larger plan for the M67 eastwards, due to the presence of some short stubs on both carriageways showing that the planned line of the motorway was for it to be continued north of the present roundabout (where there is space for some east-facing sliproads). To where? Again, that is the question. Presumably, it was meant to continue as a by-pass of Mottram north of the town, but was that it? Was it planned to go all the way to Sheffield? Of course, the natural topography of the area means that passing a motorway through the area would be extremely difficult, although not impossible. If travelling east towards Mottram, before the Hyde turning there is usually a warning of queues after the next junction. SO what does a lot of the traffic do? 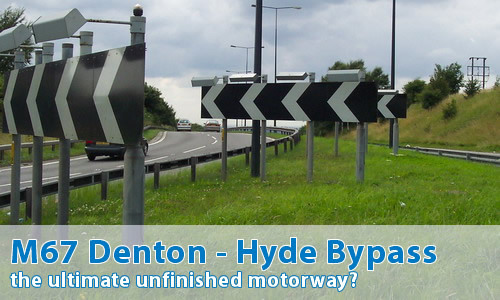 (Bearing in mind the M67 is called the Hyde bypass) It exits at the junction into - Hyde town centre! Excellent bit of forward thinking. As a nation we seem to be very good at shifting a problem to somewhere else rather than solving it! I love this motorway. It's so massively overbuilt and a great example of urban motorway design ....sometimes with three lanes each way. Then...it just stops! I make a point of driving down it every time I go to Manchester just for the thrill! Further to my comments regarding the M67, it is actually a very handy piece of road, avoiding Denton & Hyde. If you can put up with the very daft design and construction, the obvious major problem (surface water, adjacent Morrisons! ), queue jumpers at either end and the fact that a dual carriageway would have sufficed, rather than 3 lanes of road cutting through farmland, it cuts a lot of time off a journey to and from Manchester. By the way, it seems they now warn of traffic queues approaching Mottram AFTER the exit for Hyde, so there is no choice! Yes it's pathetic in it's own little way, although I'm just old enough to remember when it went between (what is now) Mottram and junction 2! It still has a quite frankly odd junction structure with exits without entrances and entrances without exits. Even more bonkers than the current version! On the other hand, I remember one weekend where the whole thing was closed due to road works. Half of Hyde was in gridlock, and I wouldn't be surprised if Denton wasn't at a standstill either. It might have pathetic ends (yeah, I can't deny that) but it doesn't half do the job - even more so when they built the M66 (now M60) out from Stockport. I've just done a post about the M67 on Hyde Daily Photo. There are a number of M67 photos on the blog but since I don't drive anymore all mine are from bridges - actually not strictly true as some are looking up at the motorway at the underside of bridges.